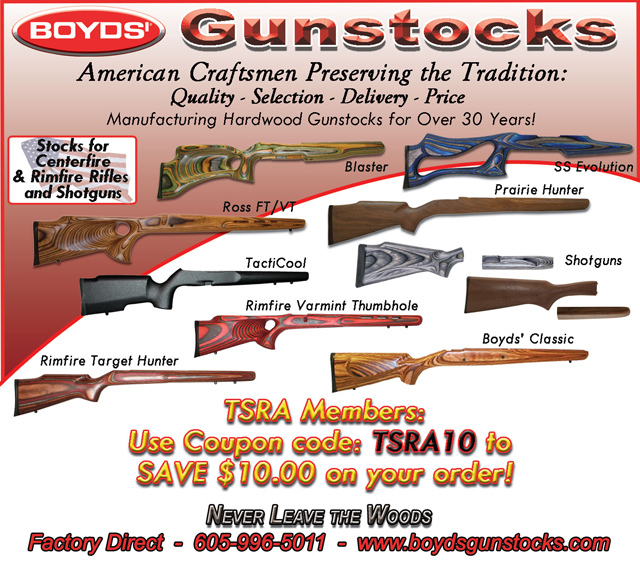 Welcome Texas State Rifle Association to Boyds’ Gunstock Industries! We are committed to offer you the largest selection of replacement gunstocks produced by the finest American Craftsmen insuring world class quality at unbelievable factory direct prices and delivered to you in a timely manner. If you do not see what you are looking for, be sure to fill out our Product Request Form. You never know what we will offer next! at 605-996-5011 - 8 AM - 4:30 PM (CST) Monday-Friday. From all of us at Boyds', we appreciate your business and wish you many happy days in the field and at the range.